LyondellBasell today announced that Pinova Holdings, Inc. has purchased LyondellBasell Flavors & Fragrances, LLC in a transaction which closed today. LyondellBasell today announced its intention to seek a buyer for the 105,000 barrels-per-day refinery at Berre, France operated by its subsidiary, Compagnie Petrochimique de Berre S.A.S (CPB). An investment banking firm will be retained to assist with the sales offering. The refinery, acquired in 2008 by LyondellBasell's former management, has not fulfilled economic projections made at the time of the acquisition. "Divesting the refinery would help us to focus on our core petrochemical assets at Berre. We will move diligently and expeditiously to prepare an offering memorandum for interested bidders," said Jean Gadbois, General Manager of the Berre site. The Berre site also has a steam cracker and world-scale polypropylene and polyethylene plants that are owned and operated by a subsidiary of LyondellBasell. The company is not looking to sell the olefins and polyolefins units at Berre. LyondellBasell Industries announced today that it has completed the purchase of the Shell oil refinery and associated infrastructure and businesses at the Berre l'Etang petrochemical complex in France. The refinery, with production capacity of 105,000 barrels per day, is adjacent to a LyondellBasell polyolefins complex at Berre that includes a steam cracker, butadiene extraction unit and world-scale polypropylene and polyethylene plants. LyondellBasell also has a polyethylene plant and a site that produces propylene oxide, MTBE and ETBE nearby at Fos-sur-Mer. "The acquisition of the Berre refinery enhances raw material integration for our operations in France and supports our polyolefins business in Europe," said Volker Trautz, CEO of LyondellBasell. "Furthermore, this transaction puts us in a better position to build upon our fuels and chemicals businesses in Europe." LyondellBasell has been the largest customer of the Berre refinery, purchasing naphtha, vacuum gas oil (VGO) and liquefied petroleum gas (LPG) as raw material for its steam cracker. Other refined products include gasoline, diesel, jet fuel, bitumen and heating oil. Approximately 1,500 employees will join LyondellBasell through this transaction, including about 500 Shell employees who already operate LyondellBasell's assets at the Berre complex. In addition to its industry leadership in polyolefins, LyondellBasell is the largest producer of biofuels in the European merchant market with approximately 1.2 million metric tonnes per year of capacity at its plants in Fos-sur-Mer, France and Rotterdam, Netherlands. The LyondellBasell plant at Fos-sur-Mer has the flexibility to produce both MTBE (methyl tertiary butyl ether) and bio-ETBE (ethyl tertiary butyl ether) in support of the European biofuels directive. LyondellBasell also operates a 268,000 barrels per day full-conversion refinery in the United States at Houston, Texas. LyondellBasell today announced that the company will restore a low-density polyethylene (LDPE) line in Wesseling, Germany, that has been out of service since January 2012. Startup of the new line is targeted for mid-2013. The Wesseling LDPE line has historically been used to produce LDPE grades for healthcare applications. Restoration of this LDPE line will enhance the company's ability to supply this important market. LyondellBasell also announced the creation of a new sales group within its European specialty polyolefins sales organization to further strengthen its commitment to, and support of, customers in the medical industry. "The restoration of this LDPE production line at Wesseling and the increased focus we will obtain through our new sales organization will enable us to better serve our customers and help them to optimize their supply chain through our higher production capability," said Bob Patel, LyondellBasell's Senior Vice President, Olefins and Polyolefins for Europe, Asia and International. LyondellBasell’s low density polyethylene (LDPE) output at its polyolefins production site in Wesseling near Cologne, Germany, remains partly shut following an explosion over the weekend, the Netherlands-headquartered producer said on Monday. The blast, which occurred at one of two LDPE plants at the site on Saturday morning, injured seven workers who were working in the area. LyondellBasell said that the second LDPE plant and all other units at the site were unaffected and are running normally. The company were unable to disclose how much of its LPDE capacity has been affected by the explosion. According to ICIS, LyondellBasell has a total LDPE production capacity of 430,000 tonnes/year at the Wesseling site. “The incident was quickly brought under control by operations and site emergency response and the affected unit was safely shut down,” said Andreas Anker, a spokesperson for LyondellBasell. “All other units at the Wesseling plant are not affected by this incident and are running normal,” he added. Anker said the cause of the incident is still unknown and will be fully investigated in collaboration with the local authorities. The seven workers suffered light injuries and were hospitalised for observation before being released on Saturday, he added. LyondellBasell announced the signing of agreements with TexStar MidStream Services, LP under which TexStar will install two natural gas liquids (NGL) fractionation units adjacent to the Corpus Christi, Texas, plant of LyondellBasell affiliate Equistar Chemicals LP. The fractionation units will be capable of processing a combined 63,000 barrels per day of NGLs produced from the Eagle Ford shale into ethane, propane, butanes and natural gasoline. Equistar will operate the fractionators for TexStar and will provide various utilities to the facility from its adjacent Corpus Christi olefins facility. In addition, Equistar will purchase ethane and propane produced from the units under a long-term agreement. The NGLs will be used as feedstocks for Equistar's olefins unit to produce ethylene and propylene. The fractionators will be located on a 40-acre site owned by Equistar and leased to TexStar. Construction will commence in April 2013 with startup projected for late 2013. "The fractionation facilities will enable us to diversify and increase our NGL feedstock supply from nearby shale formations in the region in advance of our upcoming capacity expansion at Corpus Christi, and provides TexStar the benefit of our existing infrastructure at the site," said LyondellBasell CEO Jim Gallogly. "This is another example of a project that can bring efficiency and value and be quickly implemented to take advantage of low-cost natural gas and NGLs in North America," Gallogly said. The company recently announced plans to expand ethylene capacity at Corpus Christi by 800 million pounds per year. TexStar Midstream Services, LP, based in San Antonio, Texas, provides a full range of midstream services to its customers including gathering, treating, and processing of natural gas and NGLs. LyondellBasell today announced that its methanol plant at Channelview, Texas, was placed into service in the fourth-quarter 2013 to take advantage of low-cost natural gas from shale formations. The unit had been out of service since 2004 due to the rising cost of natural gas, the key feedstock for methanol production. "The methanol plant re-start is the first in a series of U.S. Gulf Coast projects by LyondellBasell to take advantage of the natural gas price advantage that we enjoy from shale gas," said Patrick Quarles, senior vice president, Intermediates and Derivatives. "The methanol plant project and our other significant debottleneck projects will bring new capacity into our system earlier and at substantially lower cost than constructing entirely new facilities." Other LyondellBasell growth projects include expansions of ethylene capacity at La Porte, Channelview and Corpus Christi, Texas, that will add 1.8 billion pounds to the company's annual capacity, and the expansion of a polyethylene facility in Matagorda County, Texas. Methanol is used in the production of chemicals such as acetic acid and formaldehyde, and in products including adhesives, foams, plywood subfloors, solvents and windshield washer fluid. LyondellBasell is a leading manufacturer and global supplier of acetic acid. Methanol also is used in global gasoline production through direct blending, as well as for the production of methyl tertiary butyl ether (MTBE), a clean-burning gasoline component produced by LyondellBasell. LyondellBasell is one of the world's largest plastics, chemical and refining companies and a member of the S&P 500. LyondellBasell manufactures products at 58 sites in 18 countries. LyondellBasell products and technologies are used to make items that improve the quality of life for people around the world including packaging, electronics, automotive parts, home furnishings, construction materials and biofuels. LyondellBasell announced today plans to build a world scale PO/TBA plant on the U.S. Gulf Coast with an annual capacity of 900 million pounds(400千トン）of propylene oxide (PO) and 2 billion pounds （900千トン）of tertiary butyl alcohol (TBA) and its derivatives. The preliminary timetable is to have the plant operational in 2019. The project is expected to generate up to 1,200 construction jobs at its peak. The plant is expected to sell PO in the global marketplace to meet growing demand for polyurethanes, which are used primarily for the manufacture of bedding, furniture, carpets and car seats. TBA and its derivatives will be sold to meet the need for high octane gasoline blending components as well as for use in manufacturing synthetic rubber and lubricant additives. "While we have not finalized the exact location of the plant, the abundant natural gas liquids associated with shale gas make the U.S. Gulf Coast an advantaged feedstock region," said Pat Quarles, LyondellBasell Senior Vice President of Intermediates and Derivatives. "This project combines our leading proprietary PO/TBA technology with low cost feedstock and demonstrates our continued commitment to capturing maximum advantage of market opportunities." LyondellBasell announced today that it is evaluating a further expansion project at its petrochemical plant in Channelview, Texas, that would potentially add up to 550 million pounds-per-year of ethylene capacity. Preliminary engineering work is already underway to assess expansion feasibility. If the project proceeds, the anticipated time frame for completion would be 2017. The proposed expansion project would be in addition to work already underway to install two large cracking furnaces at the Channelview site that are slated to increase production by 250 million pounds-per- year when construction work is expected to be completed early next year. In addition to expansion at Channelview, LyondellBasell is increasing ethylene capacity at two other Texas plants. An 800 million pounds-per-year expansion has just been completed in La Porte. And an additional 800 million pounds of capacity are being added at the Company's site in Corpus Christi, which is scheduled for completion in late 2015. When all three are completed, a total of 1.85 billion pounds of ethylene capacity are expected each year. This figure will increase to 2.4 billion if the additional expansion project is finalized. "Our strategy continues to be the cost-effective expansion of existing facilities to take swift advantage of abundant supplies of low cost natural gas and ethane from shale production," said Tim Roberts, Executive Vice President, Olefins & Polyolefins, Americas. "The additional ethylene capacity we are already adding at our three Texas plants through existing expansion projects is the equivalent of constructing a new stand-alone cracking unit." Ethylene and related products produced by LyondellBasell are used to manufacture numerous materials that are essential to consumer durable products, flexible packaging, and automotive applications. LyondellBasell is currently the fifth largest producer of ethylene globally. LyondellBasell, one of the world's largest plastics, chemical and refining companies, today announced that it has entered into a definitive agreement for the acquisition of SJS Plastiblends Pvt. Ltd. (SJS), a polypropylene compounds (PPC) manufacturer, located in Aurangabad, Maharashtra, India. This strategic acquisition will expand LyondellBasell's existing footprint in India and further enhance the Company's position in India's growing automotive market. LyondellBasell, one of the world's largest plastics, chemical and refining companies, today announced that YPF S.A. and Grupo Inversor Petroquimica S.L. have accepted an offer to purchase LyondellBasell's Argentina-based, wholly-owned subsidiary Petroken Petroquimica Ensenada S.A. (Petroken). The sale is expected to close in late 2015 following Brazilian antitrust authority (CADE) approval. The transaction is valued at $145 million on a debt and cash free basis. Based on working capital estimates as of June 30, 2015, expected cash proceeds are $162 million. Petroken operates a 180 kiloton polypropylene plant in Ensenada and is a leading polypropylene producer in Argentina. LyondellBasell, one of the world's largest plastics, chemical and refining companies, today announced that it is advancing plans to build the world's largest propylene oxide (PO) and tertiary butyl alcohol (TBA) plant in the Houston area. This project, considered to be the largest of its kind, is expected to create up to 2,500 construction jobs and approximately 100 permanent positions. "We are moving forward in a deliberate fashion to develop what could become the single largest capital investment in LyondellBasell's history," said Chief Executive Officer Bob Patel. "We continue to believe that the combination of low-cost natural gas liquids available on the U.S. Gulf Coast, along with our leading proprietary PO/TBA technology, will allow this proposed project to capture maximum advantage of market opportunities." The Company will soon begin front-end engineering design work and file environmental permit applications. This phase will also include funding to order long lead-time equipment. A final investment decision is expected to be made following completion of the engineering design work. The Company's complex located in Channelview, Texas was selected as the site for the PO/TBA unit. The Bayport Choate site near Pasadena was selected for an ethers unit which will produce oxy-fuels for high octane gasoline. A split facility design between the Channelview and Bayport sites will optimize the product balances between the sites and create additional synergies. This project is part of LyondellBasell's previously announced $3 - $4 billion expansion effort that will take place on the U.S. Gulf Coast over the next five years. LyondellBasell has already completed work on ethylene expansion projects at the Company's La Porte and Channelview sites in Texas. A third ethylene expansion project is currently underway in Corpus Christi. LyondellBasell first announced the PO/TBA project in August of 2014. Annual production capacities are anticipated to be one billion pounds of propylene oxide and two billion pounds of tertiary butyl alcohol. The plant will sell PO in the global marketplace to meet growing demand for polyurethanes, which are used primarily for the manufacture of bedding, furniture, carpets and car seats. TBA and its derivatives, which include oxy-fuels, will be sold to meet the need for high octane gasoline blending components as well as for use in manufacturing synthetic rubber and lubricant additives. LyondellBasell, one of the world's largest plastics, chemical and refining companies, today announced that it completed the previously announced acquisition of the polypropylene (PP) compounding assets of Zylog Plastalloys Pvt. Ltd. in India. The company entered into a definitive agreement to acquire Zylog's PP compounding assets in November 2015. LyondellBasell has supplied the Indian market through imports and tolling arrangements since 2009. In October 2015, LyondellBasell acquired SJS Plastiblends Pvt. Ltd.'s PP compounding business which is located in Aurangabad, Maharashtra. With the acquisition of Zylog's manufacturing operations in Sinnar, Maharashtra, and Chennai, Tamil Nadu, LyondellBasell is now the third largest producer of PP compounds in India with an annual capacity of 44,000 metric tons (97 million pounds). In addition to the already existing product lines offered at these sites, LyondellBasell will produce its Hostacom glass fiber-reinforced, mineral filled and unfilled colored grades as well as Hifax high impact thermoplastic olefins. These compounds are used to manufacture automotive parts, home appliances and other products. "Our investments in India demonstrate LyondellBasell's continued focus on strategic growth projects that increase our competitive advantage and provide a strong return on assets," said Bhavesh (Bob) Patel, CEO and chairman of the management board of LyondellBasell. "We are proud of the high-quality products we provide to the automotive manufacturers, and our expansion in India underscores our commitment to meeting customer needs globally," he added. LyondellBasell is the world's largest producer of PP compounds with an annual capacity of 1.3 million metric tons (2.8 billion pounds). India represents the fourth largest growth market for automobiles globally with 3 million new vehicles produced each year. According to IHS Inc., India's automotive market is expected to continue growing by 6 to 8 percent annually through 2021. In its latest Global Economic Prospect report, the World Bank projected that India's GDP will grow by 7.8 percent in 2016 and 7.9 percent annually in 2017 and 2018. LyondellBasell, one of the world's largest plastics, chemical and refining companies, has made the final investment decision to build a High Density Polyethylene (HDPE) Plant on the U.S. Gulf Coast. The plant will have an annual capacity of 1.1 billion pounds (500,000 metric tons) and will be the first commercial plant to employ LyondellBasell's new proprietary Hyperzone PE technology. The project is expected to create up to 1,000 jobs at the peak of construction and as many as 75 permanent positions. Start-up is planned for 2019. "Innovation is key to our future success. This new proprietary technology will have the capability to produce a wide range of HDPE products with enhanced properties, many of which have the potential to exceed industry benchmarks," said Bob Patel, LyondellBasell's CEO. HDPE is used in numerous applications such as pipe, bottles, containers, toys, film, healthcare articles, plastic fuel tanks and industrial packaging. LyondellBasell's Hyperzone PE enhanced properties include improved stress crack resistance and enhanced balance between stiffness and impact strength. The Hyperzone PE technology is a cascade gas phase process based on LyondellBasell's unique Multizone circulating reactor technology and was developed at LyondellBasell's European research and development centers located in Frankfurt, Germany, and Ferrara, Italy. The new proprietary technology will have the capability to produce a wide range of high-performance multi-modal HDPE products. In certain applications, Hyperzone PE resins allow customers to use less PE resin per unit produced, resulting in improved resource efficiency and savings for customers. While the Hyperzone PE plant will be located on the U.S. Gulf Coast, the products produced will serve markets across the globe. "We are continuing to invest in growth-oriented projects like Hyperzone PE, where we see long term feedstock advantage," Patel added. 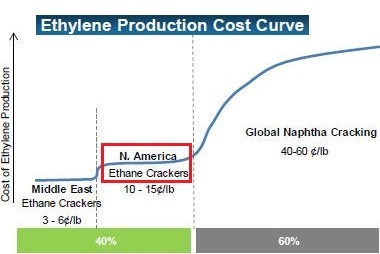 "We believe that the combination of our latest polyolefins technology and new ethylene capacity from low cost debottlenecks will provide a good return on investment. Additionally, this project enhances our ethylene integration strategy, allowing us to capture value across the ethylene value chain." LyondellBasell currently produces a total of 7.8 billion pounds (3.5 million metric tons) of HDPE annually, including capacity of its joint venture facilities. The company is a leading worldwide producer of all forms of PE with an annual capacity of 13.2 billion pounds (6 million metric tons). Consumer products made from PE are commonly recycled. LyondellBasell is a global leader in the development and licensing of polyolefin processes and related catalysts and plans to make the Hyperzone PE technology available for licensing in the future. The company has over 250 polypropylene and polyethylene lines licensed worldwide. The Hyperzone PE project is part of LyondellBasell's ongoing growth plan. Recently, the company completed work on ethylene expansion projects at the company's La Porte and Channelview sites in Texas. A third ethylene expansion project is currently underway in Corpus Christi, Texas. Additionally, development of a world scale propylene oxide and tertiary butyl alcohol (PO/TBA) plant at the company's Channelview site is progressing. LyondellBasell, one of the world's largest plastics, chemical and refining companies, has selected its La Porte, Texas, manufacturing complex as the site for a new High Density Polyethylene (HDPE) Plant. The plant will be the first commercial plant to employ LyondellBasell's new proprietary Hyperzone PE technology and will have an annual capacity of 1.1 billion pounds (500,000 metric tons). The project is expected to create up to 1,000 jobs at the peak of construction and as many as 75 full time positions. Construction is scheduled to begin in early 2017 with start-up planned for 2019. "This project represents the next generation of technology," said Bob Patel, LyondellBasell CEO and Chairman of the Management Board. "This location is ideal for this facility because of the feedstock advantage we enjoy, the ability to ship product around the world and, most importantly, the outstanding workforce that the Gulf Coast has to offer." Located on the south shore of the Houston Ship Channel, LyondellBasell's La Porte complex spans 540 acres and produces ethylene, propylene, Linear Low-Density Polyethylene (LLDPE) and Low-Density Polyethylene (LDPE). LLDPE, LDPE and HDPE are thermoplastics used to manufacture a wide variety of plastic products used in everyday life such as bottles, bags, containers, toys, food packaging, healthcare articles, automotive applications and industrial packaging. The La Porte complex is also the primary location for LyondellBasell's Acetyls business with an integrated chain of manufacturing units producing methanol, acetic acid and vinyl acetate monomer (VAM). VAM is used in household latex paint, adhesives, food packaging, wire and cable coatings and automotive safety glass. HDPE is one of the most versatile plastics because it is lightweight, yet very strong; impact resistant; weather resistant; it can be molded into almost any shape and is widely recyclable. HDPE resins produced using LyondellBasell's new proprietary Hyperzone PE technology will exhibit enhanced properties such as an improved stress crack resistance and an improved balance between stiffness and impact strength. In certain applications, Hyperzone PE resins may allow customers to use less PE resin per unit produced, resulting in improved resource efficiency and savings for customers. This technology was developed at LyondellBasell's European research and development centers located in Frankfurt, Germany, and Ferrara, Italy. LyondellBasell currently produces a total of 7.8 billion pounds (3.5 million metric tons) of HDPE annually, including capacity of its joint venture facilities. The company is a leading worldwide producer of all forms of PE with an annual capacity of 13.2 billion pounds (6 million metric tons). LyondellBasell is a global leader in the development and licensing of polyolefin processes and related catalysts and plans to make the Hyperzone PE technology available for licensing in the future. The company has over 250 polypropylene and polyethylene lines licensed worldwide. The Hyperzone PE project is part of LyondellBasell's ongoing growth plan. Recently, the company completed work on ethylene expansion projects at the La Porte and Channelview sites in Texas. A third ethylene expansion project is currently underway in Corpus Christi, Texas. Additionally, development of a world scale propylene oxide and tertiary butyl alcohol (PO/TBA) plant at the company's Channelview site is progressing. The La Porte Complex comprises two companies of LyondellBasell. The Equistar Chemicals business produces ethylene, propylene, linear low-density polyethylene and low-density polyethylene. The Acetyls business includes an integrated chain of manufacturing units producing acetic acid and vinylacetate monomer (VAM). LyondellBasell, one of the world's largest plastics, chemicals and refining companies, has broken ground on the first commercial Hyperzone polyethylene (PE) plant at its La Porte, Texas, complex. The plant will be capable of producing 1.1 billion pounds (500,000 metric tons) of high density polyethylene (HDPE) annually and will employ LyondellBasell's new proprietary Hyperzone PE technology that provides enhanced material performance. Startup of the plant is planned for 2019. "Today represents the launch of our latest innovation in plastics technology," said Bob Patel, LyondellBasell CEO. "The new Hyperzone PE plant will produce a better plastic that advances solutions to modern challenges, like protecting the purity of water supplies through stronger and more versatile pipes and ensuring the freshness of bulk foods by providing tough, crack-resistant containers for storage. This is truly a global effort developed by an international team, built to serve worldwide markets." Hyperzone PE technology enables customers to produce cost-effective, light weight plastics that are strong, durable and widely recyclable. The new Hyperzone PE technology also enables the production of a broad spectrum of HDPE products in one single plant whereas previous technologies require multiple plants. LyondellBasell is a global leader in the development and licensing of polyolefin processes. The company plans to make the Hyperzone process technology available for licensing in the future. The technology took years to advance to commercialization and was a product of LyondellBasell's global research and development teams in Ferrara, Italy; Frankfurt, Germany; Cincinnati, Ohio; and Houston, Texas. The company chose to build the new plant at its existing La Porte Complex because of its proximity to price-advantaged U.S. feedstocks and the transportation infrastructure needed to ship product to markets across the globe. The project will create up to 1,000 jobs at the peak of construction and 75 permanent positions. The La Porte Complex is one of LyondellBasell's largest manufacturing facilities spanning approximately 550 acres. The complex has two docks on the Houston Ship Channel and truck and rail transportation capabilities. Once the Hyperzone PE plant is complete, the La Porte Complex will more than double its annual PE capacity to 2 billion pounds (900,000 metric tons). LyondellBasell currently produces a total of 7 billion pounds (3 million metric tons) of HDPE annually, including its share of capacity through joint venture facilities. The company is a leading worldwide producer of all forms of PE with an annual capacity of 12 billion pounds (5 million metric tons). The Hyperzone PE plant is part of LyondellBasell's plan for $3-5 billion of investments along the U.S. Gulf Coast. The company recently completed work on ethylene expansion projects at its La Porte, Channelview and Corpus Christi sites in Texas. Additionally, development of a world-scale propylene oxide and tertiary butyl alcohol (PO/TBA) plant at the company's Channelview site is progressing and a final PO/TBA investment decision is expected in the second half of 2017. LyondellBasell (NYSE: LYB) is one of the world's largest plastics, chemicals and refining companies and a member of the S&P 500. LyondellBasell products and technologies are used to make items that improve the quality of life for people around the world including packaging, electronics, automotive parts, home furnishings, construction materials and biofuels. More information about LyondellBasell can be found at www.lyb.com. Hyperzone is a trademark owned by the LyondellBasell Industries group of companies. LyondellBasell said it is planning to build a more than $2 billion petrochemical and plastics plant along the Gulf Coast, perhaps in the Houston area, but a final decision on whether to go forward with the project is likely a year away. Bob Patel, the Houston chemical company's chief executive, said the plant would use propane, a component of natural gas, to make chemicals and the plastic polypropylene. The plant would serve North and South American markets. Patel said that market conditions ultimately will decide whether the project will proceed, but he hopes to move forward with the plans by the end of 2018. LyondellBasell already is in the midst of a massive expansion along the Houston Ship Channel, building a plastics plant in La Porte and beginning construction soon on a $2.4 billion chemicals complex spanning two locations in Channelview and Pasadena. The region's petrochemical boom has been driven largely by the cheap and ample natural gas that is produced in Texas shale fields and used as a feedstock for chemical plants. Most of the projects rely on ethane, another component of natural gas. Ethane, however, is much cheaper than propane because it is almost exclusively used in the petrochemical sector, while propane is in demand for heating and other purposes. While propane costs more, Patel said, he expects growing domestic demand for polypropylene as a plastic and fabric in the years ahead. Unlike the world's most common plastic, polyethylene, polypropylene also can be used as a fabric. In the United States, a key market for polypropylene is the automobile industry, which uses the plastic in bumpers, interior trim and even under the hood. Globally, packaging and plastic products for surging middle classes in Asia represent the biggest markets for polypropylene, Patel said. LyondellBasell's expansion along the Ship Channel will add a plant to make propylene oxide, which is used to make bedding, carpeting, coatings, building materials and adhesives, and the by-product tertiary butyl alcohol, which is refined into an fuel additive. The plant will have the biggest production capacity in the world for these chemicals, capable of manufacturing 1 billion pounds of propylene oxide and 2.2 billion pounds of tertiary butyl alcohol a year. The company will refine tertiary butyl alcohol into fuel additives at its nearby Bayport facility in Pasadena. Construction on the project is slated to begin next year, with completion scheduled for 2021. In the last few years, LyondellBasell also has completed ethylene expansions at its Channelview, La Porte and Corpus Christi sites, as well as a plastics expansion in Matagorda. Other companies are expanding petrochemical operations along the Gulf Coast, too. DowDuPont recently started up a massive ethylene and plastics plants in Freeport. Chevron Phillips Chemical Co. and Exxon Mobil Corp. are both completing massive ethane processing plants in the Baytown area. Houston's Occidental Petroleum Corp. and the Mexican chemical maker Mexichem opened a smaller ethane processing plant earlier this year outside Corpus Christi. The American Chemistry Council, a trade group, estimates that the Texas Gulf Coast accounts for about $70 billion of the $185 billion in petrochemical plants completed since 2010 or planned through 2023. LyondellBasell Announces Entry into a Definitive Agreement to Acquire A. Schulman, Inc.
LyondellBasell, one of the largest plastics, chemicals and refining companies in the world, and A. Schulman, Inc. , a leading global supplier of high-performance plastic compounds, composites and powders, today announced that they have entered into a definitive agreement under which LyondellBasell will acquire A. Schulman for a total consideration of $2.25 billion. The acquisition builds upon LyondellBasell's existing platform in this space to create a premier Advanced Polymer Solutions business with broad geographic reach, leading technologies and a diverse product portfolio. "The acquisition of A. Schulman is a natural extension of our current platform. This combination will allow us to provide our customers with a wider range of innovative solutions while adding the ability to serve high-growth end markets beyond the automotive sector, such as packaging and consumer products, electronics and appliances, building and construction, and agriculture," said Bob Patel, Chief Executive Officer of LyondellBasell. "By leveraging our proven approach to operational, commercial and business excellence, the combined business will create significant value for our shareholders and customers." "This transaction, which provides our shareholders with a compelling, immediate cash premium, represents the culmination of a robust assessment of strategic alternatives undertaken by our Board of Directors," said Joseph M. Gingo, Chairman, President and Chief Executive Officer of A. Schulman, Inc. "We are delighted to join forces with LyondellBasell, an industry leader we have admired for many years. LyondellBasell not only shares our commitment to meeting customers' demanding requirements, but with its scale and resources, the combined business will be better positioned to address a broader range of customer needs by integrating across applications and offering customers a wider range of solutions in attractive and growing markets. We also expect this combination to create significant opportunities for A. Schulman employees, whose professionalism and expertise will be integral to advancing LyondellBasell's vision, values and commitment to making a positive global impact." Under the terms of the agreement, LyondellBasell will acquire A. Schulman for a total consideration of $2.25 billion. LyondellBasell will purchase 100 percent of A. Schulman common stock for $42 per share in cash and one contingent value right per share and assume outstanding debt and certain other obligations. In addition, the contingent value rights generally will provide a holder with an opportunity to receive certain net proceeds, if any are recovered, from certain ongoing litigation and government investigations relating to A. Schulman's Citadel and Lucent acquisitions. LyondellBasell is using cash-on-hand to finance the acquisition. LyondellBasell expects to achieve $150 million in run-rate cost synergies within two years, primarily by leveraging its well-established approach to cost discipline and productivity, as well as its culture of operational, business and commercial excellence. Further, the acquisition is expected to be accretive to earnings within the first full year following close. The combined businesses had revenues of $4.6 billion and adjusted EBITDA of $446 million over the last 12 months. The proposed acquisition, which has been unanimously approved by the respective boards of LyondellBasell and A. Schulman, is subject to customary closing conditions, including regulatory approvals and approval by A. Schulman shareholders. The acquisition is expected to close in the second half of 2018. A. Schulman, Inc. is a leading international supplier of high-performance plastic compounds, composites and resins headquartered in Akron, Ohio. Since 1928, the company has been providing innovative solutions to meet its customers' demanding requirements. The company's customers span a wide range of markets, such as packaging, mobility, building & construction, electronics & electrical, agriculture, personal care & hygiene, sports, leisure & home, custom services and others. The company employs approximately 5,100 people and has 54 manufacturing facilities globally. Additional information about A. Schulman can be found at www.aschulman.com. LyondellBasell, one of the largest plastics, chemicals and refining companies in the world, and Odebrecht S.A., the controlling shareholder of Braskem, a leading plastic producer in the Americas, in a joint statement today announced the companies have entered into exclusive discussions regarding a potential transaction between LyondellBasell and Braskem. "Both LyondellBasell and Braskem share a strong culture of operational excellence and legacies of value-creating innovation. We believe that the potential combination of LyondellBasell's and Braskem's complementary strengths, product portfolios and operational footprints would create significant value for our shareholders, customers and employees." "Braskem's board of directors and management have been informed of the existence of these discussions. The discussions are preliminary and no agreements have been reached. Among other things, the parties will need to complete appropriate diligence, negotiate definitive agreements and obtain corporate approvals. There can be no assurance the discussions will result in a transaction or on what terms any transaction may occur. LyondellBasell and Odebrecht S.A. do not intend to make any further comment unless and until the discussions conclude or are required by applicable law." LyondellBasell Industries NV is close to presenting a binding offer to acquire control of Brazilian petrochemical company Braskem SA, two people with knowledge of the matter said. LyondellBasell is discussing the extension of a long-term naphtha supply contract with Petroleo Brasileiro SA seen as pivotal to valuing Braskem, and talks between the companies are expected to finish over the next days, the sources said, asking for anonymity because talks are private. Once a long-term supply contract is established, LyondellBasell is expected to bid for control of Braskem, first through an offer to controlling shareholder Odebrecht SA. Odebrecht, a Brazilian conglomerate involved in the country’s widest-ever corruption probe, has been forced to sell assets over the last two years.